Celebrate the holiday season with your friends and neighbors at the City of Palm Coast’s annual Starlight Event and Parade on Saturday, Dec. 14, at Central Park in Town Center, off State Road 100 and Bulldog Boulevard behind Flagler Palm Coast High School. Admission is free. 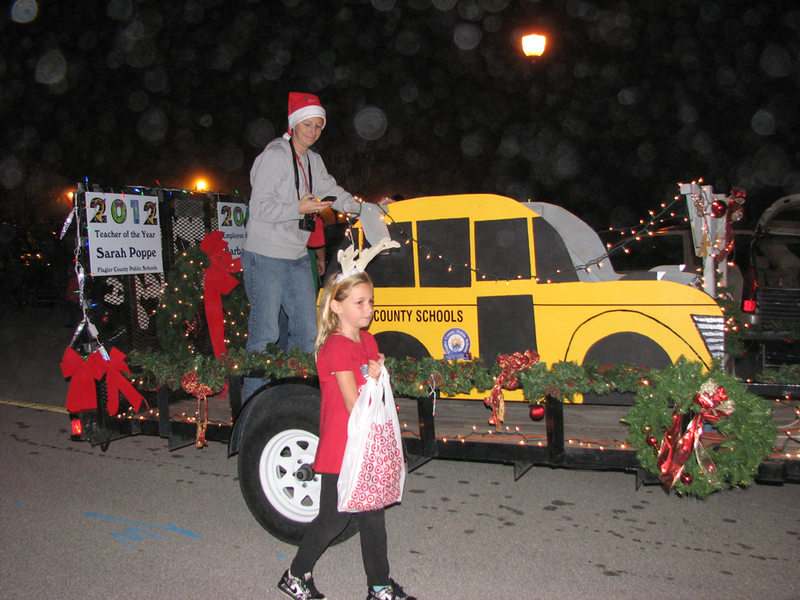 In Flagler Beach, the Roatry Club of Flagler Beach will once again be hosting the Holiday at the Beach Parade, which this year is scheduled rain or shine for Saturday, Dec. 7, starting at 1 p.m. This year’s theme: “Flagler’s Got Talent.” The Rotary is asking parade viewers to bring an unwrapped gift. Donations will be accepted during the parade. And a little further to the north, many members of The Hammock Business Association will be Lighting up The Hammock the First Two weekends of December in the latest edition of Holidays in The Hammock. Starting at Washington Oaks, venues and business in The Hammock will display distinctive white Holiday lights as well as colorful larger than life portrayals of Christmas presents. See more details below. 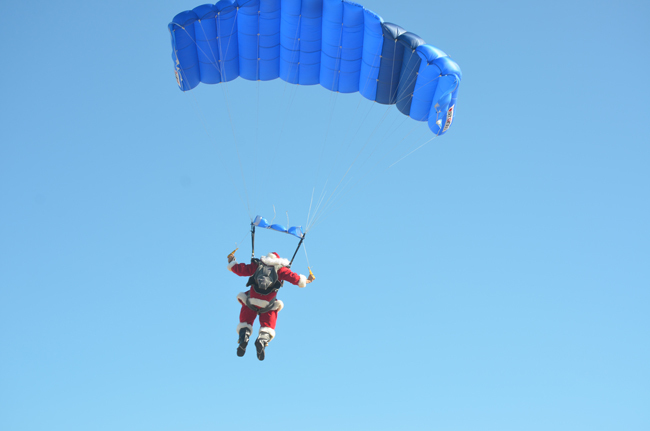 In Palm Coast on Dec. 14, the day kicks off at 2 p.m. with an afternoon of live local entertainment and performances including a 70-foot Snow Slide, the arrival of Santa and pictures with Santa; fun with The Grinch, face-painting, sand art, Letters to Santa activity (bring your own stamps), and refreshments available for purchase. Santa will visit with children until 5:30 p.m., and a photographer will be available for photos. Activity prices vary. The Starlight event wraps up at 5:30 p.m. just in time for the start of the annual Starlight Parade. At 6 p.m., the Starlight Parade will get under way – featuring colorful lighted floats, talented marching bands, and prizes for the top entries. Leading off the parade will be the participants of the Starlight Half Marathon and 5K, which is part of the Palm Coast Running Series. The parade route will begin at the Round-About on Central Avenue (east of Market Avenue) and head east; turning north onto Park Street, east onto Lake Avenue, and south on City Place, then continuing south of Bulldog Drive. The grand marshal will be City Historian Arthur “Art” Dycke, a Palm Coast resident since 1993. A retired history teacher and community college instructor, Dycke was a co-founder and first vice president of the Palm Coast Historical Society and continues to serve as a board director. The commentators for the Starlight Parade will be Palm Coast Fire Chief Mike Beadle and his wife, DeeDee Beadle. The Starlight Event and Parade are sponsored by Palm Coast Ford and the Palm Coast Observer. For more information, visit www.palmcoastgov.com/starlightparade or contact the Palm Coast Parks and Recreation Department at 386-986-2323. Back in the Hammock, you’ll be able to see the following Christmas sights: “Go with the Glow” from Washington Oaks State Gardens south on Scenic A1A to the Amvets as Post 59 at 5959 N Oceanshore Blvd. They are right next door to the new restaurant ‘386’ located at 5949 N Oceanshore Blvd. Then check out next door for Le Cose Belle in The Pink Building. This quaint gallery offering a dazzling array of art and gift items. Cross the street and you will find Captains Barbecue tucked into Bings Landing. You can then see Santa at Hammock Hardware. Santa and Mrs. Claus will be there to help gather gifts and food for the needy in our area and hand out a few treats. For a more adult atmosphere, you’ll have the artfully decorated confines of Hammock Wine and Cheese. More than a few cups of kindness will be offered here this Holiday Season. If your yen is for a relaxed restaurant with a sports bar appeal, check out J.T’s Restaurant for sea food, burgers and a lot more. Then come to Hammock Gardens all decked out in its Holiday Finery offering an array of plants, pottery and even some mistletoe if you are too shy to kiss the pretty lassies unasked. We need to get rid of the Holidays. Too commercialized and poor children suffer torment and bullying from rich ones. You want to celebrate something…go to church and celebrate the birth of Jesus Christ on Christmas………….Narcissism and Greed has destroyed the true meaning of the Holidays !!!! !